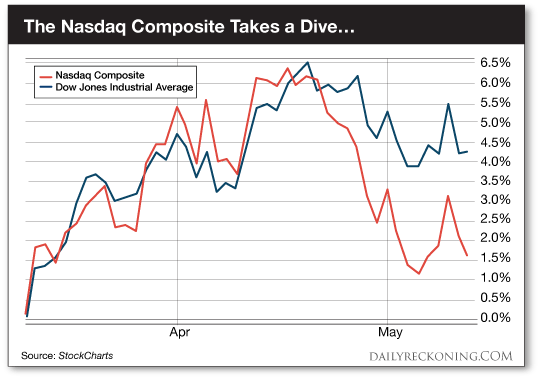 Are Tech Stocks About to Crash the Nasdaq? The market continues to lurch lower this week. Retail stocks were the first to burst into flames. Now household tech names and biotech stocks are feeling the market’s wrath as the weekend approaches. The Nasdaq Composite is a shell of its former self, lagging the major averages and hosting some of the biggest blow-ups on the market right now. The Nasdaq Composite dropped another half percent yesterday—even though the Dow Jones Industrial Average managed to finish the day in the green. That’s not an isolated incident. 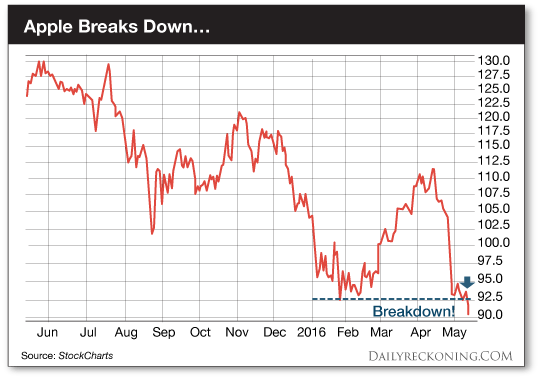 The tech-heavy index and the Big Board broke up three weeks ago. In the meantime, the Nasdaq has dropped nearly 5%. We’ve kept close tabs on the tech wreck as it has ripped through the market over the past several weeks. And as we warned earlier this month, it could get much worse before it gets better. In case you haven’t bothered to keep track, the list of terrible tech earnings just keeps getting longer. Google’s parent company Alphabet missed analyst estimates for earnings and revenue for the first quarter. Microsoft whiffed on first quarter earnings. Twitter has quickly reclaimed garbage stock status as it pushes new lows. And it’s not just the garbage stocks that are dragging the Nasdaq to hell. 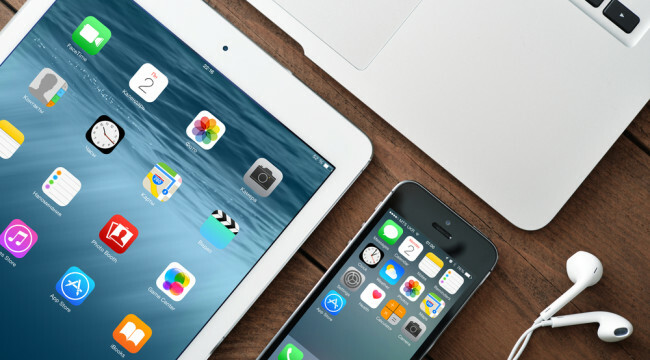 Even Apple Inc. (NASDAQ:AAPL) and Netflix Inc. (NASDAQ:NFLX) shares are feeling the burn. In fact, these two stocks helped lead the Nasdaq lower yesterday. Apple and Netflix each dropped more than 2% Thursday, while Apple pushed new 52-week lows. Then there’s that other tech group— I’m talking about biotech. These stocks staged a nice little relief rally back in late April. While the major averages were taking long walks off short piers, investors actually gobbled up biotech stocks, shunning the “safe” utilities sector. But the relief rally was short lived. Now, it’s looking more like a dead cat bounce. 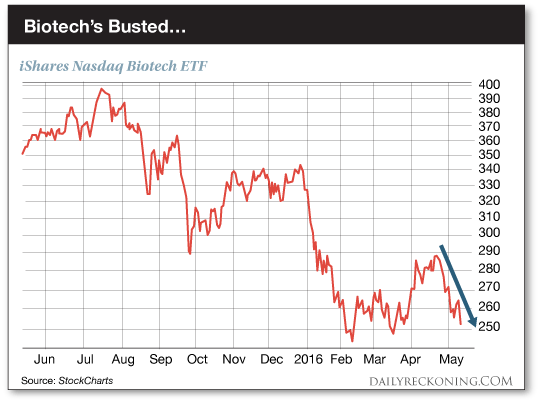 Biotech stocks are getting dangerously close to their February lows. A break below this mark would probably lead to even more carnage in the sector. We’re already seeing some of the biggest biotech names crumble this week. P.S. Make money in a falling market–sign up for my Rude Awakening e-letter, for FREE, right here. Stop missing out on the next big trend. Click here now to sign up for FREE.